Jejuri Khandoba Temple is very important for the architectural evolution as a hill temple complex in Maharashtra. The temple is around 48 km south-east of Pune, towards the town Phaltan. 200 stone steps lead a devotee to Khandoba Mandir located atop a hillock. Jejuri is the abode of the God of the oldest tribes in Maharashtra, the Dhangars. A community of shepherds, they are deeply devoted to Khandoba (Lord Shiva) as he had married Ganai, the daughter of a shepherd. Couples visit the shrine after marriage and a couple has to make the offering to the deity together, standing next to each other. Lord Shiva appeared as Khandoba to slay demons Mani and Malla. Divti is the martial symbol of Khandoba. It has the shape of a dagger, but doubles up as a lamp. When lit up the dagger is a symbol of light that slays darkness. The temple was initially constructed in 1608 AD. The Sabhamandapa and other parts were completed in 1637 AD by a Maratha chief, Ragho Mambaji. The peripheral rooms and other additions were done by the Holkar rulers. The pillars were added in 1742 AD and Tukoji Holkar completed the battlements and the tank in the year 1770 AD. Chhatrapati Shivaji Maharaj met his father Shahaji, after a long gap of 14 years, and discussed guerilla strategies to ward off the Mughals at the temple. Then it was also a strong fort of the people of the region. The main Jejuri Khandoba Mandir is located on the Karhe Pathar, a mountain about 300 meters above the present temple complex. Devotees generally visit and worship Khandoba in the lower temple. Over the centuries, the shepherd communities who consider Khandoba as their family deity have added gateways, the improved flight of steps, constructed deepmalas, cloisters, nagarhanas etc. People who have had their wishes fulfilled too have added many structures. All additions to the original temple fit in a pattern to Maratha architectural structure. The temple has minarets and chhatris around the corners, the surrounding cloisters have pointed stone arches with grills or windows. The temple has an old Portuguese bell and a huge brass plated tortoise of 7 meters diameter which is used for the ritual of distributing turmeric and dry coconut. Nana Phadanvis the regent of Peshwas of Pune offered one hundred thousand silver coins for the fulfillment of a vow. These coins were converted partly into ceremonial silver images and other into ornamental mahirap (background). There are three sets of murtis (images) at Jejuri which show the craftsmanship of jewelers, coppersmiths, and other artisans. Chang Bhale Khandobacha Yelkot – is a popular chant at Jejuri Mandir. 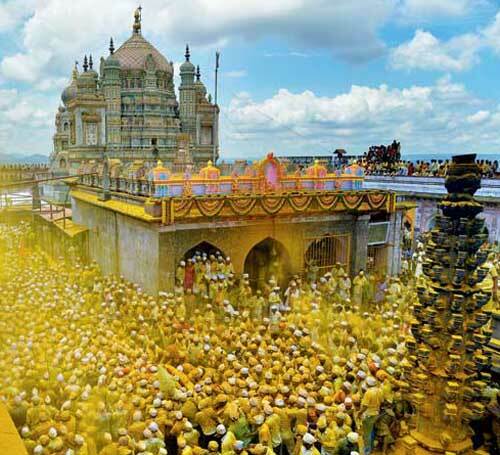 Throwing of turmeric powder is an important ritual at the shrine and it is known as Bhandara. Jejuri Khandoba – Malhari Martand Bhairav Festival andRathotsav - this six day festival begins on Kartik Amavasi and ends on Champa Sashti. During important festivals and rituals, the temple sees a gathering of nearly a million devotees. Other important fairs and festivals take place in the month of Chaitra (April), Paush (January) and Magh (February). The famous among it is the Khandoba Shikar Khati Yatra. The no moon day or Amavasya falling on Monday – Somvati Amavas – is highly auspicious at the shrine. Kaara River flows beneath the hillock and on Somvati Amavas the utsava murti of Khandoba takes dip in the river. There are many elaborate customs associated with Khandoba Jejuri Temple. Bagad – In this ritual, a person who has had his desire fulfilled after prayers in the temple complete the vow he had taken. The vow includes hanging from a pole with the help of hooks inserted in the skin on the back. Kathya, ceremonial tall bamboos, wrapped with red turbans are carried by Holkars, Holams and Khaire families and they touch with it the Shikhara during the festivals on the full moon days. The breaking of steel chain or langar is another way of completing a vow. Some devotees walk on fire or ‘Hal’ carrying water from the river in the ritual known as kavad. Some devotees arrange performances of dancers and musicians (dances of Waghya and Murali).